Meanwhile in Jerusalem, yet another reminder of the wanton ordinariness of the violence on the minds of an untold number of our neighbours. 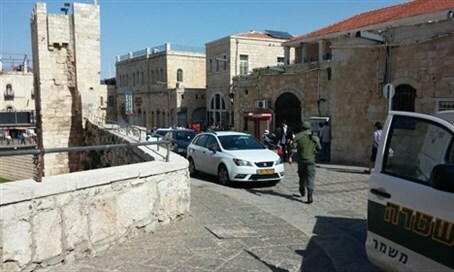 An Israeli woman in her forties, guiding a group of visitors in the vicinity of the Old City's Jaffa Gate, was assaulted this morning by a Palestinian Arab attacker. Like several other perpetrators of acts of terror in and around the capital, this one was a resident of the Jabal Mukaber neighborhood. He fled on foot after smashing her over the head with a bottle, and police and Border Guard personnel gave chase, catching up with him at Kikar Zahal (IDF Square, next to Jerusalem's City Hall). The assailant is 22 years old. 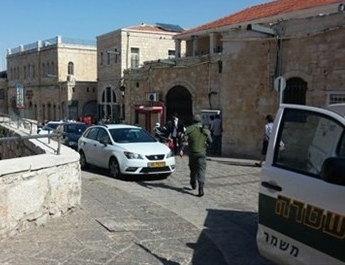 His victim suffered light injuries and was taken by Magen David Adom (MDA) ambulance for emergency treatment of head injuries at Hadassah Ein Kerem Hospital.